Originally, I thought this was a Nissan. Let me try a close-up view of that sign at Wildwood State Park. Who has a year for this Lincoln? Okay, this is for Harley experts, or motorcycle experts in general. Obviously this was customized by some aftermarket garage, so it's not a Servi-Car, but does anyone have a model name for the bike? Another one here. These pics are in a wooded area in Calverton, New York. All three look like Chrysler products, but the truck could be something else. [...] but the truck could be something else. I don't know for the cars, but the pickup is indeed a Mopar product. 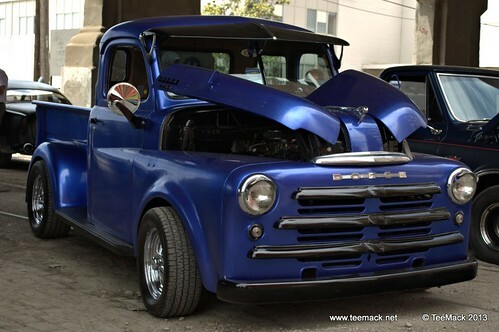 The wheel rims are obviously a later modification, but if the rest is genuine, it's a 1950 Dodge B-2-Series: 1948-50 cab with a 1950+ Low Side bed. Most probably a ½-ton B-2-B, as it appears to have a really short bed. Or a 1948-49 B-1-B if the bed was changed. I thought that might've been a Dodge B-Series, but the grille didn't seem right. My other choices were a Wilson from Canada, or even a Powell. On another topic, can someone give me one good reason I shouldn't believe this Ford Mustang is a 1968 GT California Special? Another thing, does this look like a Freightliner Cascadia to anyone else but me? All details seem indeed to match. Another step outside of the Wikimedia Commons. The American Truck Historical Society is having a hard time identifying many of these trucks, but honestly, most of the ones I've seen there are Whites. Now how about something that I just submitted to this site? I don't think this is a real Harley. It looks like a Japanese Harley-fighter. Which model had the big circle logo on the tank with wings and an arrow pointing down? How about this van from Australia used to promote Lambretta scooters? Can anyone else see the insignia on this truck? Looks very 1950s Austin/Morris?? Local build of lots of BMC trucks out there. No, but I can see a Giga sign on the drivers door and a CXH sticker under the windscreen on the passenger side so it should be an Isuzu Giga CXH [some numbers]. How about this fire truck next to the Ford C-Series. I keep thinking Hahn for some reason.